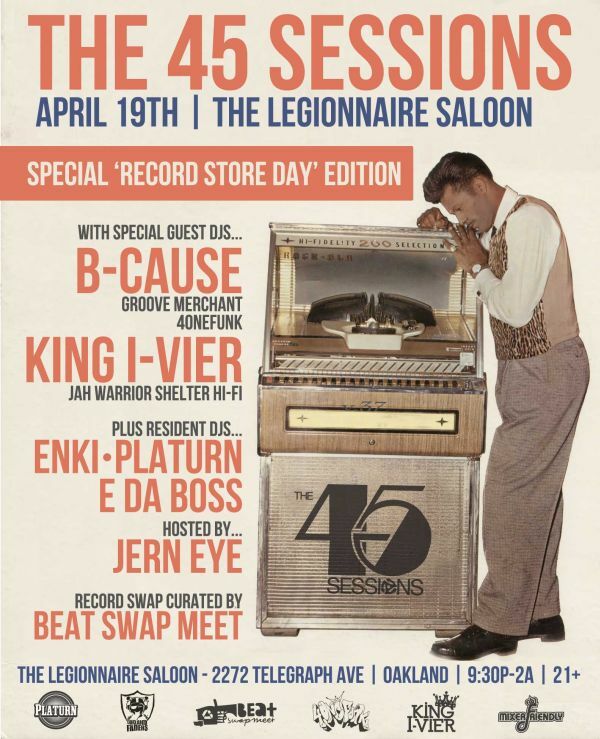 Join us at our new home, The Legionnaire Saloon, on April 19th for our special ‘4.20 RECORD STORE DAY’ edition with two legendary DJs/vinyl pushers from the Bay Area, DJs B-Cause of ‘4onefunk/ Groove Merchant Records’ & King I-Vier of ‘Jah Warrior Shelter Hi-Fi’ and former owner of Wisdom Records. Classic rap/hip-hop VS classic reggae dancehall/rocksteady all night. We are also launching our collaboration with the legendary BEAT SWAP MEET and will have our first round of vendors ready to go night of — join us for a night of heavy heavy music as we celebrate Record Store Day in true 45s fashion! …and DJ Flow. Bring cash to buy and get ready to get those fingers dirty — space is limited so there will be nothing but quality pieces available. No filler! Early arrival also strongly suggested if you want the good stuff. Don’t sleep!